The Belgrade Fortress is a unique museum of the history of Belgrade. The Fortress was built as a defensive structure on a ridge overlooking the confluence of the Sava and the Danube in stages, during the lengthy period between the 1st and 18th century, from a Roman castrum, through a Byzantine castle and the remains of the medieval capital of the Serb Despotate, all the way to an Austrian-Ottoman artillery fortification. The complex is made up of the Belgrade Fortress itself, parts of the walls and some individual buildings from different periods have been preserved such as gates, museums, monuments, towers and churches, divided into the Upper (Despot’s Gate, Sahat kula - Clock Tower, Roman Well, Statue of the Victor) and Lower (Nebojša Tower, Amam – Turkish bath, Gate of Charles VI) Towns (Gornji/Donji grad) and the Kalemegdan Park. 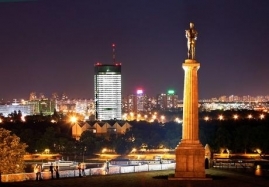 The Belgrade Fortress offers an exciting view of the confluence of Sava and Danube, of New Belgrade and Zemun. Kalemegdan contains the Cvijeta Zuzorić Art Pavilion, the Music Pavilion, and the Great Staircase (Veliko stepenište), the Zoo, children’s fun fair, and a number of monuments, sculptures, sports and catering facilities.